Information and communication technology with a focus on the digital economy and the implications of the development of electronic commerce is increasingly playing an active role in the development and growth of the global economy. The implications are wide and diversified. This includes the facilitation of trade transactions and acceleration of movement of capital through the new rules of the digital economy with the removal of time and distance barriers. The impacts are varying in density and effectiveness between developed and developing nations. Electronic commerce could be beneficial to business and socioeconomic development in the north (developed world) as well as in the south (developing nations). Small and medium-sized enterprises stand a unique opportunity worldwide to optimally leverage their capacities and excel from the diversified communication channels the digital economy presents. However, one challenge remains critical and that is the growing digital divide emerging between developed and developing nations as well as within developing nations themselves, which could deepen income and wealth inequalities. In that respect, the government role in developing nations in preventing the widening of the digital divide is becoming increasingly vital with implications that vary and affect business, culture and the society at large. During the past two decades, electronic commerce has had a diversified variety of impacts on organizations of all types and sizes. Such impacts differed from one country to another and from one environment to another, depending on the local conditions and the adaptation of the society. Implications related to the management and leadership of the organizations, their vision, mission and strategies, policies, governance, the organizational learning, ethics and culture among other elements. This chapter demonstrates the role of the government of Egypt in introducing, diffusing and institutionalizing electronic commerce. Electronic commerce represents a tremendous challenge and at the same time a great opportunity for growth and development, and hence it needs an institutional role to regulate it. Electronic commerce promises great potentials for developing nations giving poor nations and their populations additional access to markets, information, and other resources that would have otherwise been inaccessible. However, there has been a great fear of a digital divide emerging between developed and developing nations. Hence, the governments’ involvement of developing nations, such as Egypt, in preventing the appearance or the widening of the digital divide is of paramount importance. With respect to electronic commerce, the role of the government is highly different from its traditional role in other conventional areas that have been subject to extensive research, such as infrastructure and social services amongst others. 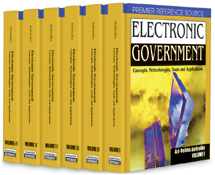 It is different because electronic commerce is a newly ventured domain for government involvement that requires substantial thinking and structuring of the role it should play; it is more or less a comprehensive new role with aspects related to setting the rules for market operations as well as developing control measures to handle the risk factor associated with electronic commerce-related investments. Electronic commerce represents both a challenge and an opportunity for a developing nation such as Egypt with potentials for growth and development. This chapter introduces electronic commerce in Egypt with a focus on the prevailing status and the institutional role of the government to regulate electronic commerce and develop the electronic trading industry.